COME DOWN INTO THE BODY. WAKE UP TO YOUR BODY. I am streaming in the opposite direction. Everything I have been looking for out there – acknowledgment, approval, wisdom, guidance, healing, inspiration – is here, right here. wherever it is that you want to go. 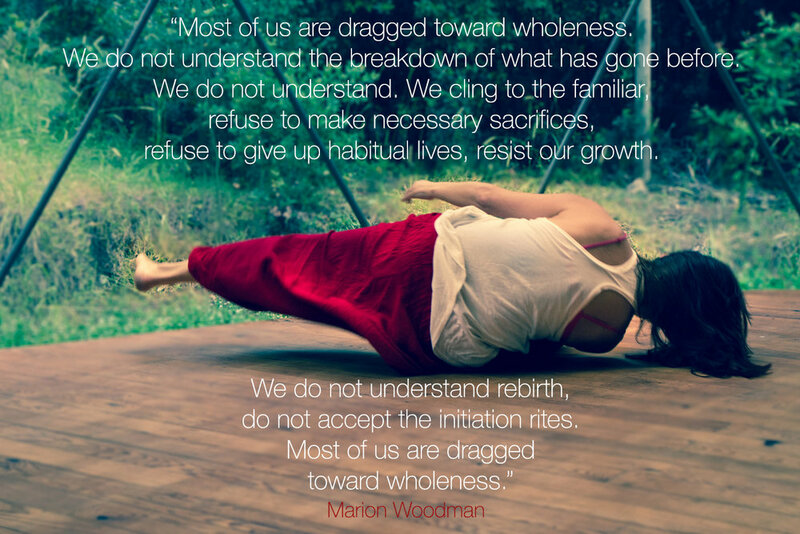 This downward movement I am talking about is not one of collapse or sinking (maybe sometimes is and that is also necessary) but one of active surrender and willingly switching gears and shifting attention in the direction of the body. My exploration began with Earth medicine, dance and walking. I needed to put “matter” around the hollow inside (heal the motherwound) and touch on the ground with my two feet. The ground (Mother Earth) was calling, a thorough investigation into the foundation, the basement of my being ignored far too long. What I call Earth medicine is “to be exposed to the elements and to make oneself vulnerable before the presence of raw nature”. This is what activates that primal, wild energy within, the animal self who had been cast away in the process of becoming “civilized”. This is the primordial life force stored in our cells that knows how to survive and adapt (not obey or comply) to the evolution required for that organism. Unknowingly but certainly intuitively, I took myself to places of wild, beauty and resonant emptiness (reflecting my state back to me within a wholeness) and allowed Life to flow into me through the crack. And did it flow, it rushed into my body and through my body, dragging my confused and worn out mind along into the wild mysteries of the world. To be sovereign in the world, one of my deepest longings, is to be sovereign in my inner-queendom. This deep urge is often projected into the world as fighting for our rights (and rightly so) however if it is not accompanied by a deep inner inquiry of reclaiming sovereignty in the psyche, it won’t go beyond fighting and temporary triumphs. I am solemnly responsible of developing – growing, healing, studying, holding myself accountable and pulling the resources I need towards my center – myself as a queen in the inner realm so I can hold that presence in the world. I am not talking about an isolated, ego-enhancing “personal development” process to manifest one’s own wealth in a world that is both dying and being reborn. What I am pointing at is embodying the soul in the world so I can live up to my destiny that is in service of the whole, which may not look like what my conditioned mind imagines it to be. The misfortune of the modern human being is that s/he is often alienated on the soul-centric path in the absence of community, elders and rites. So the descent into the body continues. Today it was forehead on the ground, barely wanting to move out of the mat, let alone rising and kicking high. I am willing to shed even the movement I thought coming from my body and be with the inertia which I often experience as resistance to movement. I can easily and subtly manipulate (force) my body out of it but today I stayed with it, which is hard. “What if I stay immobile forever?” fears my mind. Now, my invitation is to go beyond everything habitual, sometimes a quick maneuver of spiritual bypassing, even if that looks like a flowing movement of my body. If I am to figure out to trust something, anything, can I begin right here with my body? I often talk about “listening to the body” and it seems like there are more levels of that listening that I need to discover. a landing space for symbols and metaphors, the language of the soul? This is a recording of me reading a text by Marion Woodman, from the book "Coming Home to Myself". The piece is called “Initiation into the Deep Feminine” and it describes the process of initiation Marion Woodman went through. Through her journey in India, being initiated into her body, she found immense power and inspiration for her future work with the Feminine. It is shared with profound love & gratitude for the work Marion Woodman moved (and continues to move) in the world and for the healing power Mama India embodies.